In organizing we are always looking for creative ways to get people out of their comfort zone and engage with others. 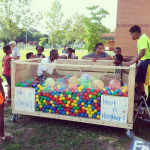 In 2013, the high school interns who I get to supervise each summer, were inspired to create a neighbor-making ball pit to use at community events and block parties. It took us a few days to build but the outcome was a fun creative tool for community engagement.